The famous Rig Vedic verse "Ekam Sat" narrates to us that the God or the Parmeshwar has the three divine powers on this earth. The Brahma, the Vishnu and the Shiva. The ancient books and the Rig Veda depicts us that Shiva is a living God and is immortal. And this sacred Amarnath yatra will take you to the holy Amarnath cave which is dedicated to Lord Shiva, the divine power of immortality. 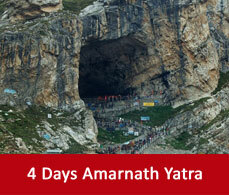 Amarnath yatra is conducted annually which takes the pilgrims to the holy cave in Jammu and Kashmir. This pilgrimage is taken place during July and August. But the dates vary depending on the weather condition and the occurrence of Purnima. This cave is housed at an altitude of 3,888 metres above the sea level. It remains frozen throughout the year but during summer the snow starts melting and forms a stalagmite of ice which is believed to be Lord Shiva according to the Indian mythology. Beside Lord Shiva two other small ice stalagmites are formed which are believed to be Maa Parvati and son Ganesha. Devotees eagerly wait for this Amarnath yatra tour every year when the Indian Government opens up the gateway for the sacred Amarnath temple. This sacred cave surrounded by majestic mountains and sloping valleys hides a mythical story within itself. The holy truth or story according to Indian mythology is that Lord Shiva have narrated the sacred truth or secret behind immortality to Maa Parvati and told that anyone who hears this Amar Katha or the secret will be immortal. During His narration of the secret He made it assured that no one is hearing it. But Lord Shiva was unknown of one truth that beneath the Deer Skin on which he takes Samadhi laid two eggs of pigeon who heard that secret to immortality. It is said that when they hatched out of the eggs they remain immortal. It is said that some devotees see those holy pigeons on their pilgrimage and it is considered to be propitious. 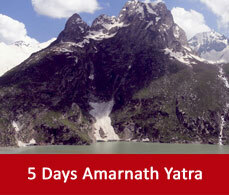 The climatic conditions of Amarnath yatra varies quite frequently. Snowfall and rainfall are expected at any time of the day. This holy shrine is situated in the Himalayas about 140kms away from Srinagar. Pilgrims reach Srinagar by hiring a coach or a cab and from there they start their holy journey towards the divinity. From here pilgrims generally start their journey on foot and in groups and it takes 5 days to reach there. But helicopter services are also available for those who find it difficult to travel on foot. 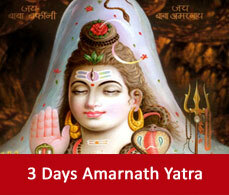 Amarnath yatra packages are available to make your journey blissful and holy.